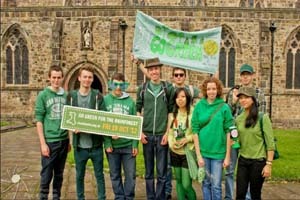 SENRGY students help to save Rainforest on GO GREEN Day! Recently, you may have seen a lot of green people out and about in Bangor. Happily, these were not aliens, but modern “Eco-Warrior” Bangor students! Bangor students have been working with Size of Wales, a Welsh environmental charity aiming to save 2 million hectares of rainforest. The charity aims to use the negative measurement term of “An area the size of Wales” as a positive measurement to reduce forest destruction. With the help of Size of Wales, Bangor students aimed to turn that negative use of the country’s size on its head, by encouraging the people of Bangor to take positive action and help raise £500 to protect an area of rainforest the size of Bangor in Madagascar. SENRGy students, Alison Cross and Thomas Edwards were the student ambassadors, who along with fellow students organised Go GREEN walks from Bangor pier, along Bangor High Street to Menai Bridge, GO GREEN quizzes in Bar Uno and selling wristbands on GO GREEN DAY (October 19th). Through all the hard work and effort, an amazing £722 was raised, with every £1 saving a hectare. Reflecting on their efforts, Alison notes that “this was a great way of raising money and awareness of the rate of rainforest destruction and hopefully the money will go towards saving a vital part of the Madagascar rainforest”. If you still wish to donate a £1 or more then please visit the Bangor Tribe at the following website: http://www.sizeofwales.org.uk/tribes/bangor_university/.